Tell us about Bajou. His personality, what he enjoyed. In his photo he has a direct and confident look. He is very handsome. Bajou was a very special cat. He was wise beyond his years and calm in a away you imagine a cat to be by the time he'd reached his 8th or even 9th life. He was an old soul with a peaceful nature, always comforting to be around. He took to just about anyone, with a playful nature and a lust for life he was easy to befriend. Bajou was a mystical character… I could tell right away that there was a magic to him that I hadn't encountered in a cat before him. But above all there was a softness to him, he was a caregiver and a great friend. How did Bajou come into your life? Rescued from abandonment as a kitten, Bajou made his way to the Kitty Haven Shelter in Johannesburg, South Africa. Although off to a challenging start in life, Bajou made the best of his circumstances and naturally he made himself a great friend: Neo, a playful little tabby cat with the temperament of a lion. Bajou and Neo were inseparable at the shelter. As a result, when Bajou came home to me, Neo came along with him. Bajou and Neo came to me at a difficult time, but soon filled my home with the joy of kitty craziness. They played together, curled up on the couch together. They were the greatest friends, and together, the three of us were a family. But then Bajou became ill. So incredibly sad. How old was he when he contacted the disease? What were some of his symptoms? As a kitten Bajou had no health issues and in many ways was the stronger of the pair. However when Bajou was about 10 months old, I noticed he had lost a little weight and his coat condition was not what it had been. Having seen a vet for routine inoculations and so on, I thought perhaps he just needed to be dewormed again. Off to the vet we went. The vet took a look at him, dewormed him, gave him a bit of a booster shot and sent us home, telling me to watch him closely and bring him back if he didn't improve. I hadn't really noticed any significant changes in his behavior except that he ate less than before. Still, his condition wasn't improving. A week later we went back to the vet. During this visit my vet, in a calm and caring manner, advised me that there were three possibilities and that tests would need to be conducted for either Feline AIDS, Feline Leukaemia or FIP. I had never heard of these diseases and wasn't sure how alarmed I should be, but in the pit of my stomach I knew it couldn't be good. The vet informed me that they would take blood and test for all three, although the test for FIP was not straight forward and the diagnosis was deduced from analysis rather than direct testing for presence of the virus. I went home, confused and concerned, to research these diseases on the internet and leaned that cats of Bajou's origins were often afflicted by these conditions, but I remained positive. FIP is an incurable viral illness that affects cats. The disease is still cloaked in uncertainly but it appears to occur due to the presence of the feline coronavirus in the cat's system. FIP is fatal. The primary physical symptom is inflammation in the containing tissue and in some cases the accumulation of fluid. This occurs in the stomach or chest. The disease occurs in two forms, wet and dry, with wet being most common. In Bajou's case, we believed it to be the dry form---his symptoms included severe weight loss, complete loss of appetite, fever, and eventually difficulty walking and moving around. It must have been a difficult time for you. I'd grown up in a house with cats, read books on cats, been a cat person my entire life. I'd volunteered at animal shelters and shared my home with cats as an adult, yet I had no idea that any of this was possible. I knew the basics of caring for a cat--inoculations, deworming, annual check-ups, proper diet and so on, but I could never have imaged that a merciless, incurable disease could take a kittens life in such a swift and tragic way. I felt a sense of guilt for not being aware and immediately my thoughts turned to what I could and should have done to avoid it, but I soon learned that little could be done and that it was likely that Bajou's fate was sealed before he and I ever crossed paths. Still, this was no solace at all. What treatments did your vet pursue? Our vet prescribed a Prednisone medicine in tablet form to reduce the inflammation. I also had to change his diet significantly to include highly palatable foods like tuna to coax him into eating. Was it possible to make Bajou’s last few months peaceful and comfortable? Perhaps the most tragic part of Bajou's story is that a mere ten days passed between official diagnosis of his disease and his passing. There was so little time to say goodbye. And yet in some cruel way, it may have been for the best… his discomfort was so obvious and was almost impossible to overcome. The medicine seemed to help a little, some days he would pep up, eat a little, even play with his companion Neo, for as much as his energy levels would allow. But for the most part, we just spent as much time together as we could. He would sleep in the bed, under the covers with me at night. I made sure I was by his side as much as was possible. Neo never left his side either. We were hopeful, sending out positive energy and encouragement around him. He knew we loved him, this was the only real comfort we could give him. When Bajou was sick you started a Facebook page for him: A Prayer for Bajou. Were you hoping to reach out to other cat owners? I had never experienced anything like this. The torment of these kinds of diseases in pets is devastating, because our pets are a part of our families. They mean as much to us as our friends and families do and to watch a living creature suffer is simply intolerable. I knew that others out there must have been through the same and I guess I was hopping to find people who's experiences had ended in survival. Ultimately, I just wanted people to pray for Bajou to make it through it. And then, sadly, Bajou passed away. At his favorite spot in the sun near the foot of my bed, Bajou lay down and went to sleep on a Saturday afternoon. He never woke. You continue to run Bajou’s Facebook page. What would you like Bajou’s legacy to be? Do you want a sanctuary on Facebook where others who have lost their cats from FIP can seek comfort? I hope people will share their experiences with others who have been through similar difficulties, to celebrate the cats that touch their lives and to share knowledge and understanding about the disease. A kind member of the group recommended a natural immune booster product for Bajou just after he was diagnosed. I was touched by the support and understanding that these people shared. Anyone who encounters this would benefit from sharing their experiences. 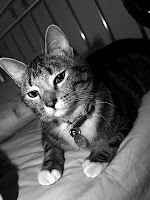 It seems senseless that such a painful experience should be without a positive message--Bajou's legacy must be to raise awareness about FIP and other incurable kitty ailments. What can we do to help stop FIP? FIP research is ongoing. Until we find a cure, the best medicine in preventative. Support research programs and donate what you can, when you can. FIP is most common in high density areas and may be transmitted through feline contact and common use of litter boxes. Keep your cats safe, indoors if necessary. Take them out on supervised walks. Make sure litter boxes are changed and cleaned out regularly, not shared if possible. The challenges experienced by cat shelters are even greater, caring for animals in large numbers with limited resources, but even in shelters and havens a preventative measure like regular cleaning of litter boxes may make the difference. An FIP vaccine exists, although its efficacy is in question. What do you have to say to people who are going through this horrible disease with their cat? My heart breaks at the thought of anyone supporting their feline family member as they fight a disease like FIP, but to these people I would say, you are with your cat for a reason. Our pets walk a journey, with us as their companions, just as we walk the journey of life. They choose us. In their darkest times, they will now how much you have loved them. Always remain hopeful. Cats sense our energies, staying positive is important to their comfort. Most importantly, enjoy every moment with them and always remember them fondly. I admire your desire to keep Bajou’s memory alive by helping others share their experiences. Do you have anything else to add? I would just like to urge people to keep adopting. Keep giving kitties in need a home. These experiences are painful and tragic, but do not let our stories deter you from adopting and supporting your local shelters. Every cat deserves a chance at a happy life and the love of a caring dedicated parent. Even if their stories end in tragedy, they will have been loved and given love, in a way that only a cat can. Finally, I'd like to thank you, Ann, for sharing Bajou's story. Neo and I are both very grateful to you. You're very welcome. Thank you for telling Bajou's story. I know it must have been hard to hard to recount the experience. Bajou will live on by raising awareness of this very serious feline illness. And hopefully one day soon there will be a cure. Samantha donates a portion of the proceeds from her online vintage clothing store to the Kitty Haven Shelter where she adopted Bajou. Her store can be found at www.angivintage.com. 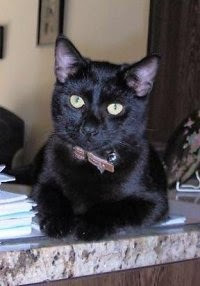 To read more about the latest FIP research, treatments and programs, check out the April 2011 issue of Cat Fancy magazine. Sweet Bajou has touched so many lives and has done a remarkable job in raising the awareness of this horrible disease. Thank you so much for sharing this story, I really felt like I knew him. This is absolutely wonderful, thank you for everything... Neo and I just read the article and we're very grateful indeed. My little Bajou is not forgotten. Thank you to Brian and Carolyn for your kind words. Thank you for sharing sweet Bajou's story here. He was a truly beautiful and wonderful soul. Thank you too for the info on FIP. It is such a cruel disease and very very frightening and unforgiving. 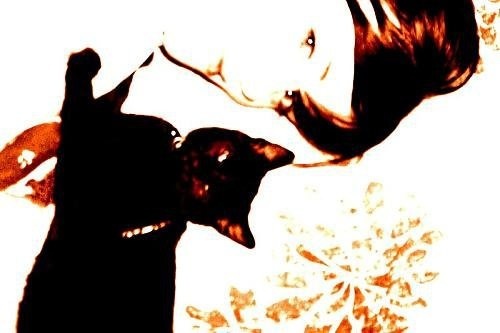 My cat, Charlie, and I are sending you, Samantha and gorgeous Neo lots of purrs and hugs. I am so sorry that Bajou got such a terrible disease. I cried as I read the story. But he sure was happy to have such a wonderful family. I hope there will be a cure some day. Thank you so much for sharing the story. Thank you so much for sharing Bajou's story with us. What a wonderful tribute to him, and what a wonderful legacy his all-too-short life is. We are sending you hugs, purrs and prayers. Thank you so much for sharing Bajou's story with us Ann and Samantha. It sounds like he was a very special kitty, and was quite handsome too. FIP is such a terrible disease, and I purr that one day a cure can be found. Thanks for telling us about sweet Bajou. It's obvious he was dearly loved even though his time was much too short. I hope they can find a cure one day.